MONA’s optimal technique was developed from the most accurate information that we have about swimming, including the applicable principles of physics (biomechanics and hydrodynamics), experimental findings from several decades of research, and many thousands of Aquanex trials of synchronized underwater video and hand force data. MONA includes four views (front, side, top, and bottom) of all four competitive strokes (butterfly, backstroke, breaststroke, and freestyle). There are command buttons to select the stroke at the top of the main window and a standard multimedia control at the bottom. The stroke button selects any of the four competitive strokes. The multimedia control has the standard options to play, pause, and step through the video clips frame by frame. As each set of video images is displayed, the arm and leg phases are updated. The phase names indicate the primary action for the motion. For example, in freestyle, backstroke, and butterfly there are four arm phases: pull, push, exit, and entry. The four arm phases for breaststroke are outward pull, inward pull, recovery, and glide. For each position within the stroke cycle, there are head, arm, and leg cues. 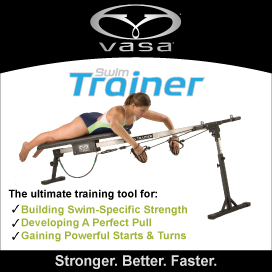 The cues are specific information that a swimmer can use to control his/her movements to swim faster. The cues are worded in terms of the swimmer’s body parts and the position of those parts with respect to other body parts or with respect to the surface of the water. There are both visual cues (to see) and kinesthetic cues (to feel). When the single frame advance button is clicked, the images in all four views are updated, as well as the associated text (arm and leg phases; head, arm, and leg cues; and notes). Review an entire stroke cycle and see how the head, torso, and legs maintain positions that minimize resistance. The head cues will help you achieve a position with minimal resistance. Next, step through the stroke cycle and note the arm phases and the transitions between arm phases. Then, note the cues for the arms at each transition. Use the cues at these “checkpoints” to begin to modify your technique. As permanency develops, add the cues for the frames within each phase. Keep in mind that it takes weeks or even months to make a permanent change in technique, and that a permanent change is necessary before you will see an improvement in performance. Continually focusing on the cues, even when you are tired, will help you make the changes more quickly.